Bought 10" Campy's for one of my cars and through lots of measuring found that the wells are too narrow for the tires to fit under, and looks pretty bad. Both sides are the same. Is it possible for a body shop to jack the wheel well out about 1". How risky would this attempt be? Original 10"Campagnolas fit the narrow wheel wells. What campy's do you have ? These are Forged Alloy, Marvic I believe. They fit fine on another car, and there is a pretty big difference in measurement. Just another thought... and I don't know if I would want to do it to a set of orginal 10" campy's but could you have the wheel machined to change the offset? Of course you would need to make sure you don't hit anything on the inside of the fender well when changing the offset. Or maybe a little of both. A slight machining of the wheel and a little body massage doing a little less dramatic push on the fender. Just spit balling. I did consider this, but there's not enough meat on the inside of the wheel to take off that would make any difference. On that subject, anybody who is considering these wheels should know that they do have a negative offset, and not positive as their spec sheet shows. I thought at first that they where made wrong. Marvic wheels are sand cast magnesium, if these are aluminum alloy they are more likely to be Roin wheels if of European manufacture. Worth double checking when cautioning against purchase and questioning specs. But then from what you stated it sounds to be more your car than the wheels? There looks to be a lot greater tire stand out on the rear, almost appearing as too much toe in, has your car been accident repaired, have you checked rear wheel alignment? What tires do you have on them? A wide bulbous side wall tire will make them stick out more. Don't know how they got that way, but it is the arches, and not alignment, or tire width. Does the tire stick out from under the fender edge an equal amount on the other side? In other words, is the rear of the car symmetric? An owner recently informed me his Pantera has a 10mm difference from side to side in this respect. What size is the tire? If 305mm then that looks about right to me. The tires are only 275/50's. One side is about 1/4" more flared than the other but visually they look the same. Was just hoping someone with body work experience would chime in. There are some places that can "roll" fenders. There is a special tool made specifically for this. In the wrong hands it can make a mess of the fender. One inch would be a lot to ask for even with a fender roller. I would advise against it unless you have someone VERY good doing the rolling and even then would not be overly comfortable with the process. I have done a couple hundred fender rolls for the german look tuning boys! It was very popular here a few years back . Its possible to get about 15-20mm with out painting if the car has original paint! sheet metal has to be over 70 degrees Celsius or the paint will crack.If it is re painted you never know what happens its a gamble!! To just roll up the inner lip is easy and often helps more than you think. 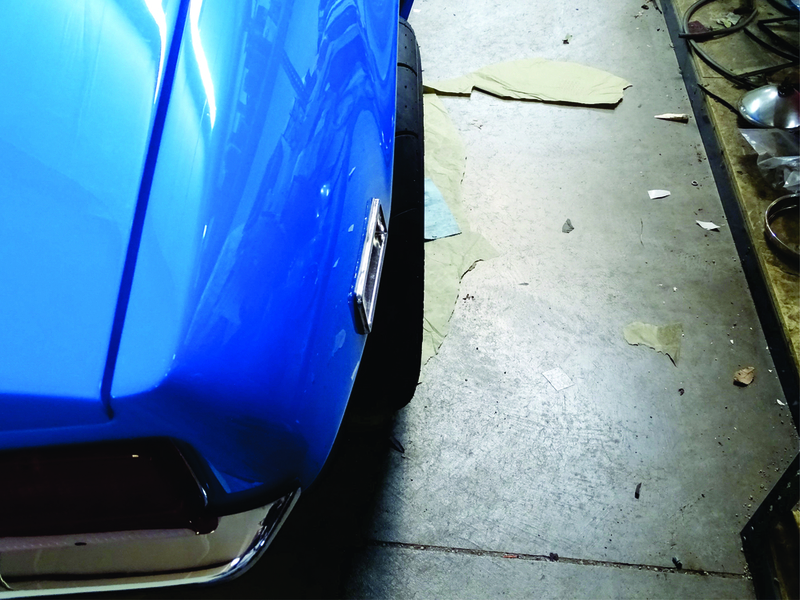 I have never done it on a Pantera but i think it should be easy to get the hole fender to move outward a bit at the same time, Because it has no inner fender as normal cars. just find someone that is good on it. Dont go this way , it damage the whole fender . One side of the fender on the rearside of the Pantera is a part of the tail panel . Not like the European cars or the US muscle cars. It damage the part of the tailpanel between the exhaust hole and the out side of the fender. Believe me , I have experience whit this. Better to buy an original set of Campy's and sell the Rion wheels. Okay tanks for the info Simon that is then the weakest point! So don't try to roll it then! its pretty obvious when you think about it, its going to draw the corner out of shape when there is noting holding it!